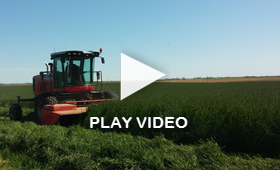 Alfalfa Hay for Horses | Anderson Hay & Grain Co., Inc.
Alfalfa is an important component of an active horse’s diet. Safely fed to horses for thousands of years, Alfalfa’s high protein, fiber, vitamin and mineral content all contribute to its high feed value. A horse fed Alfalfa as part of its daily ration will meet its need for protein while receiving essential vitamins and minerals. The high protein and mineral needs of young, growing horses and lactating mares make Alfalfa an important part of any feeding program. Alfalfa’s high palatability ensures that even the pickiest of eaters will maintain the proper balance in their diet. A horse needs a fairly small amount of protein per day. Roughly 3/4 to 1 pound of digestible protein (DP) will meet most horses’ daily requirement. This need can be met by supplying Alfalfa as half of a horse’s roughage. Feeding horses Alfalfa reduces or even eliminates the need for supplements which often have a laxative effect. Our commitment to supplying high quality Alfalfa year round gives horses a consistent and safe supply of protein. Alfalfa is most beneficial for horses with high energy needs due to their moderate to high level of exertion. Alfalfa may provide too much energy, protein and nutrients for horses that are only occasionally exercised. Those horses that spend less than five hours a week performing low to moderate intensity activities, such as showing or recreational riding, do not require the high levels of nutrients that high quality Alfalfa supplies. A feed program for recreational horses should limit Alfalfa and include forage with high chew time, such as Timothy hay to combat idleness. Alfalfa has a high nutritional quality, containing vitamins A, D, E, K, U, C, B1, B2, B6, B12, Niacin, Pantothenic acid, Inositol, Biotin, and Folic acid. 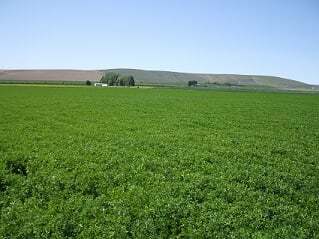 Alfalfa also contains the minerals Phosphorus, Calcium, Potassium, Sodium, Chlorine, Sulfur, Magnesium, Copper, Manganese, Iron, Cobalt, Boron, Molybdenum and trace elements such as Nickel, Lead, Strontium and Palladium. Horses require trace minerals to combat skeletal distress and help in the bone development of young growing horses. When Alfalfa is fed to horses along with a diet of Timothy hay, they will receive many of the nutrients required and all of the fiber needed to build the base of a strong nutritional program. For information on ordering Alfalfa Hay, please contact us online.